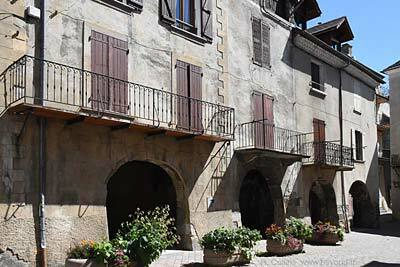 St-Bonnet-en-Champsaur very picturesque old village in the Haute Alpes, north of Gap, with 16th-century houses and tower, covered grain hall, old fountains and a few nearby sundials. It's a nice little town with many restored and colorful old buildings and a reasonable shopping area in the town center. 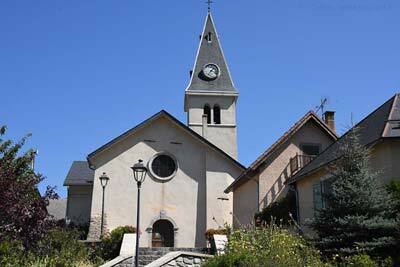 Driving to St-Bonnet-en-Champsaur you turn off the N85 highway onto the D945, cross the Drac river and go up past the town on the west side to find the main parking up at the north end of town. There's a large, open area at the top of the village, with the main parking area, the town hall (Mairie) and the beginning of the village shops, including the Bar Les 3 Tonneaux (apparently known to the locals as Chez Lisa). 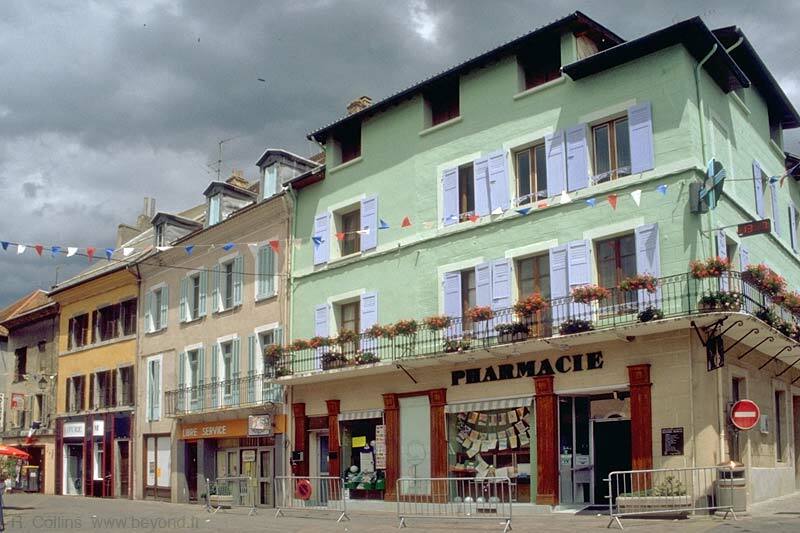 The main village street, Rue Chaillol runs downhill to the main square, Place Chevreril, with the village shops all along the descending street and all around the square. This main square has a pretty fountain in the center and is lined with colorful buildings, shops and café-restaurants. 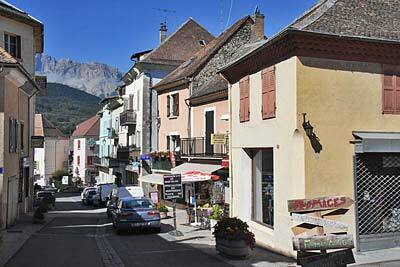 On a previous July trip, there was a busy market here, and stands for an Artists dans le rue event. Off to the right (west) of Place Chevreril is Place Grenette, with the ancient covered grain hall, the 16th-century fountain and the Office de Tourisme. 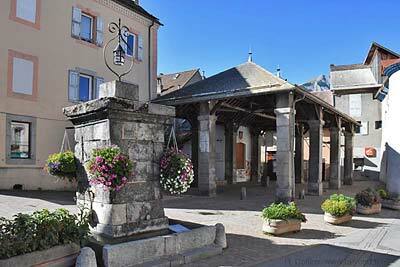 The grain hall and the old fountain are probably the most picturesque, historical features of St Bonnet-en-Champsaur. Further down into the heart of the old village is the small, cobble-stoned, Place aux Herbes, with a covered arcade (tounes) along one side of the square. Several of the narrow little streets nearby have vaulted passages ("andrones"), some rather long; the purpose of the "andrones" wasn't so much to protect the pedestrians from bad weather, but to augment the habitable area of the houses. The parish church at the bottom of the village is very pretty, with white walls and a tall, pointed belfry and clock tower. The original chapel was established in the 12th century and enlarged in 1350. It was badly damaged by the Wars of Religion in the 16th, and further pillaged by the Duc de Savoie in 1692. It was rebuilt in 1836 in its current form. On our first trip here, in the summer of 1998, we asked at the tourist office (Société d'Initiative) about sundials. The man running the place had in his head the locations and details of all the old sundials in the surrounding area. for the all the territory round-about. 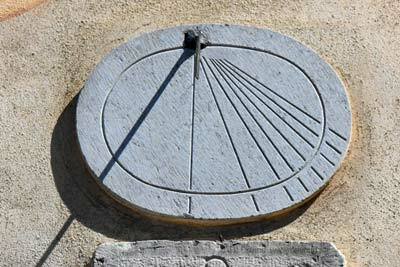 The only sundial in the village is the stone oval [our photo] on the village church. The next nearest sundial is the colorful classic sundial on the Combe Fleurie chambres-d'Hotes just north of town; this one was done in 2000 by the famous Remy Poty. IGN (1/25,000) #3437 OT "Champsaur, Vieux Chaillol"
Didier Richard (1/50,000) #7 "Hautes Alpes"
There are several restaurants in St Bonnet-en-Champsaur, including some open on Sundays and off-season. 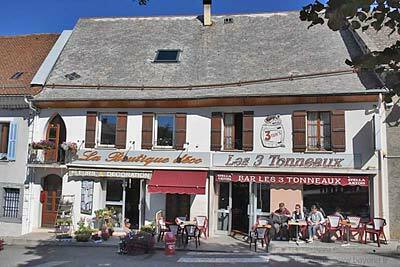 On our Autumn 2015 trip we had picked out one to eat at, with local fare, but the advice of a village lady sent us to Chez Marie (Auberge de Marie). Our first idea might have been good, but Chez Marie was great. On a previous summer trip we lunched at the pizza restaurant Les Tounes, and were very satisfied.